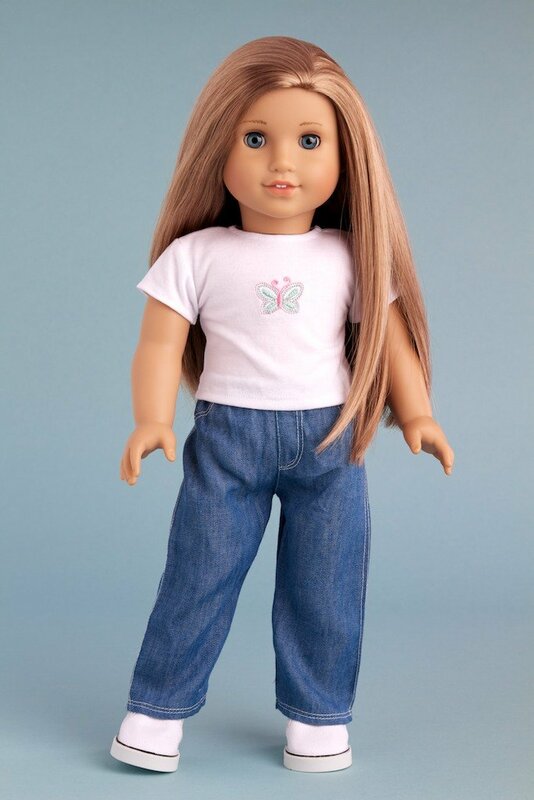 American Girl Doll Play: DreamWorld Collections - A Giveaway! DreamWorld Collections - A Giveaway! I am so excited to share another fabulous giveaway with you this week! This time, from DreamWorld Collections. I get to give away to one lucky reader, this adorable City Chic clothing set for 18 inch dolls. This is a 4 piece set that includes a pink ruffled jacket, a white t-shirt with an adorable butterfly on it, some classic blue jeans and the outfit is completed with some canvas sneakers. A girl (or your doll) can never have enough fashion options right? Make sure that you "Like" AG Doll Play on Facebook! 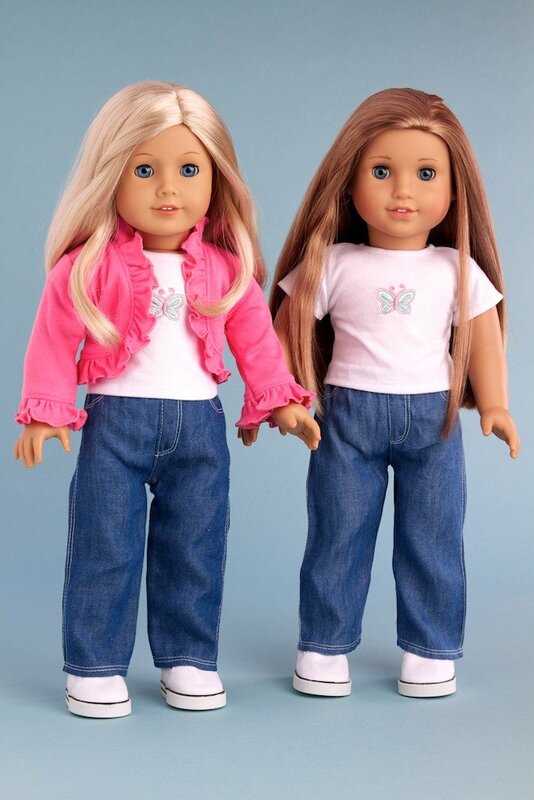 "Like" DreamWorld Collections on Facebook and share that AG Doll Play sent you! Leave a comment here in this post sharing that you did the following AND share what outfit is a favorite of yours after checking out their website here. That's it! Pretty easy to be entered into the drawing. One winner will be chosen from all those individuals that do the above and will be announced here on Sunday, August 11th, 2013. Please note that this contest is open to US residents only...thank you for understanding. Full Disclosure - I have been compensated for this post with product or payment, however I always work with sponsors that I truly believe in and whose product I value and enjoy using (or that Zoey loves playing with). All opinions and ideas shared regarding products are mine. Hi AGdollplay I love your blog! I will post about it on mine as soon as possible! I want to enter your giveaway! I do like you on Facebook (Sophie Trahan)! I also like Dreamworld. Wonderful, thanks Sophie and good luck!! Also I do not have a Facebook or pinterest.I do have a blog ! I want to enter! Do you have to like people on Facebook? I don't have a Facebook. Thanks Hanna! If you don't have FB that is fine, thanks for posting and sharing and entering the giveaway! My favorite outfit is the Brown cowgirl outfit! Shared a link on my facebook page and liked both pages and commented that AGDoll sent me to Dreamworld. My favourite outfit is the Black Swan. I love that one too, so elegant! Thanks for entering! Thank you and I agree!! Cute out fit. please enter me in the give away. I'm a facebook fan , I shared the link and became a fan of Dreamworld Collections. I love the Pinky Pie PJ's. I have liked you and Dreamworld Collections on facebook and said you sent me there! My daughter says her favorite outfit is the Let's Go Shopping outfit. Yellow dress with ladybugs and red purse! Please enter us in the giveway! Thanks! Thanks for entering Julie, good luck! Hello, I'm already a fan of DreamWorld Collections and like your website as well! I had my daughters pick one outfit they like the best and they chose "Princess Kate Royal Wedding" and "Ice Skating Fun". Thanks for the opportunity to enter your giveway! I'm now a fan of both yours and DreamWorld Collections, and I commented on their Facebook page. My favorite DreamWorld Collections outfits are the City Chic and the Move It! outfits. I am the Dreamworld Collection's biggest fan and would like to enter the sweepstakes for the City Chick outfit. It would be a great addition to our existing collection. Thanks. Please let me know how you will be contacting the winner as it is a little unclear. Thanks. Thanks Mistycat! I love the City Chic outfit too!! The Yin and Yang Karate / Teakwondo outfit is just so cute, my granddaughter is really in to teakwondo and would love to have this for her AG doll. That would be perfect!! Thanks for sharing! I have liked and shared, i also love the zebra print bathing suit they have on the web page. Thanks for entering Melissa!! That's a super cute outfit, I agree! I liked both AG doll play and Dream world collections on Facebook. My 7 year old daughter and I both love the Cotton Candy outfit! So pretty! And of course it is her favorite color...pink! I liked AG Doll Play and Dream World Collections on Facebook. Thanks Allie, love your blog too! 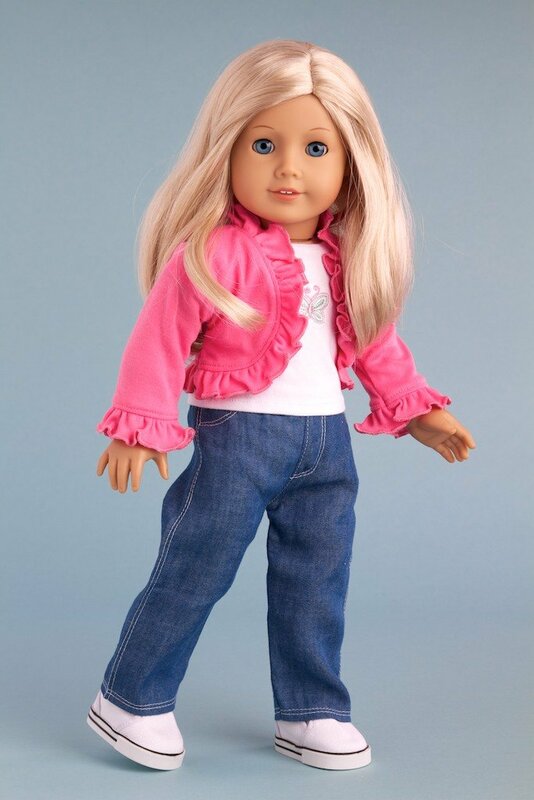 I have that outfit on my doll right now and every time I see it, it makes me smile! I liked AG Doll Play and Dream World collections on Facebook. My FB page is so full of Doll sites for my lovely daughter!!! I shared the link on my FB page! My daughter is into sports so she loved all the sports outfits especially the ying yang outfit. I want to enter the giveaway. I don't have Facebook but I did post on my Blog. I also LOVE the Cowgirl Outfit!! I did all of the steps above (screen name: Jessica Hendrickson) and my favorite outfit is the Happy Holidays - Red velvet sparkling holiday party dress with white tights, red sparkling shoes and decorative head band. Thank you for the wonderful giveaway! I have been a fan for a little while now on both sites. My favorite outfits would be Kate's Wedding Dress, Feeling Happy, and of course, City Chic!! hi! I would love to enter! my favorite outfit is fun loving girl.